Royal King Cole was born in New York on June 3, 1907. His birthplace was found in census records and his birth date is from the Social Security Death Index. He was the oldest of two children born to Thornton B. and Etta Berger. His father was a writer and actor who joined D.W. Griffiths’ film company, Biograph, around 1910. The death of Thornton Cole, a Biograph actor, carried away one of the most capable character men in the motion picture profession. Mr. Cole, wife and two children, came to Los Angeles with the Biograph aggregation. After a few weeks here Mr. Cole became ill and died of heart failure. Mr. Cole had been with the Biograph five years. His wife is not in the profession. The date of his death was February 21 and he was buried at the Albany Rural Cemetery. …Tony Sarg is very much his familiar self in his “illustrations.” Mrs. Henri (Marjorie Organ) is as incisive in two drawings as she ever was at the shows of the independents, while Royal K. Cole, “fifteen years old,” has already gone so far that some of our leading comic artists should be very much afraid of what he will do next. The 1925 New York State Census recorded Cole, his mother and sister in the Bronx at 2005 Walton. His occupation was cartoonist. According to the 1930 census, they lived remained in the Bronx but at a different address, 1130 Anderson Avenue. Cole continued as a newspaper cartoonist. According to American Newspaper Comics (2012), Cole’s first strip was Christmas in Toyland, which ran for most of December. Christmas-themed strips would be his annual contribution for the next five years, ending with the Quints' Christmas in 1940. 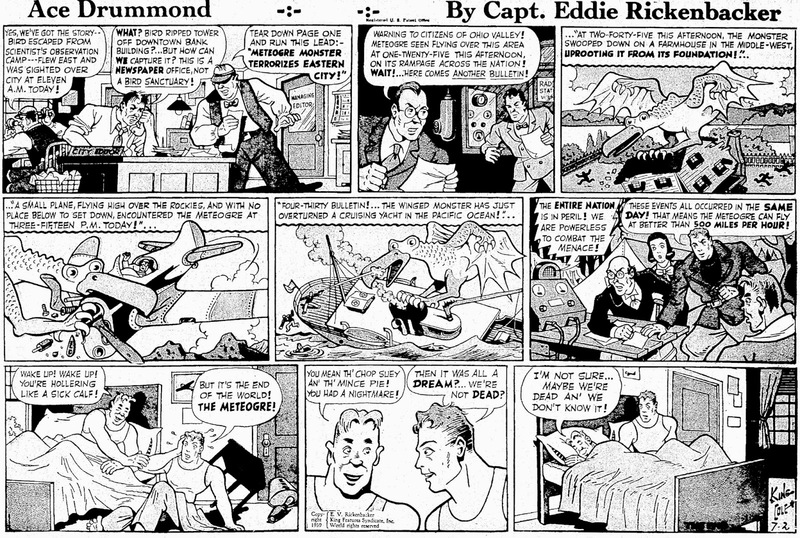 Cole produced the Ace Drummond strip from some time in 1937 to the end of the series in 1939. The final Sunday page was published July 2, 1939. In 1940, Cole, his wife, Kathryn, and mother-in-law, Lora Goodwin, resided at 87-84 165th Street, Queens, New York. Cole was writer, and his wife, a vocational school teacher; he had four years of high school, and she, four years of college. In a few years Cole moved to Hollywood and wrote screenplays for a number of serials and movies. The 1944 North Hollywood city directory listed Cole at 11346 Emelita. His occupation was writer. Like all writers, he had a tendency to overwrite things. He would always inject unneeded adjectives in the box captions and bog down dialog with long wordage. He’d go on and on, stealing my thunder since everything was already written out and I couldn’t even begin to create as much impact as I would want to with my drawings. A reader can get frustrated with so many descriptions in words when he can see what’s going on by glancing at the drawings. The drawing should always come first and the words second….I never really cared for the stories that Royal wrote, anyway. They just weren’t interesting. Cole’s last writing credit was in 1974 for a segment of the Three Stooges Follies. At some point Cole moved to Arizona and was found at four locations: 10618 North 26th Place, Phoenix; 7044 East Hubbell Street, Scottsdale; 201 South Greenfield Road, Benson (1992); and 245 South 56th Street, Mesa (apparently his last address). Cole passed away August 14, 1993, in Mesa, according to the Social Security Death Index.